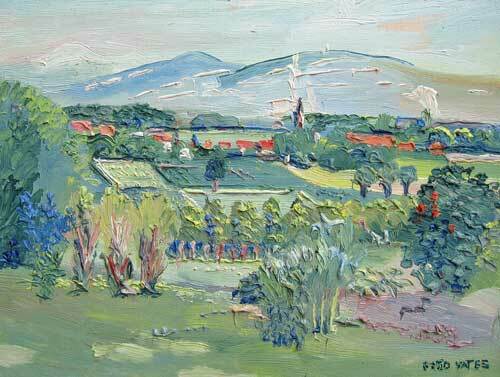 Fred Yates painted outdoors at every opportunity. He loved the great impressionists and believed as they did that the artist should be out in the landscape to truly ‘experience’ a painting. Although his best work was often painted outdoors when unable to venture out for whatever reason he would then paint from memory too. Often capturing remembered scenes from his days back in and around Manchester or later in Cornwall. 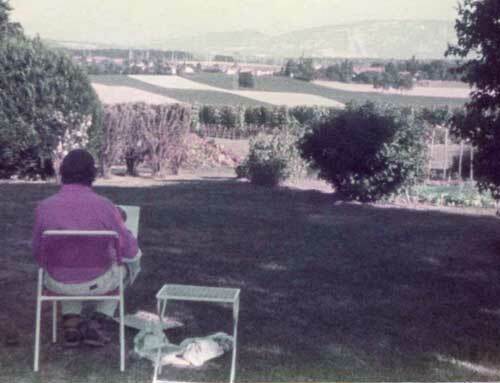 The photograph below shows Fred Yates pictured seated en plein air painting the landscape. was working on in the above photograph. The painting opposite is available for sale from Orangehat Contemporary Art and Ceramics.